A visitors guide to the FDR Memorial that includes opening hours, handicap accessibility, parking, tour information, and historic information about the design. Nonpartisan Pedicab is the premier option for Washington DC dog friendly tours. 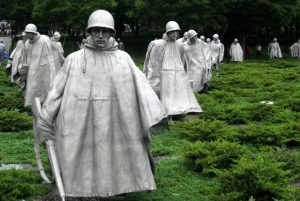 You can visit all the monuments in DC at your own pace and schedule. Handicap parking at the Smithsonian Natural History Museum is available on Madison Drive. Unfortunately, the handicap entrance is on Constitution Avenue. Jefferson Memorial handicap parking is available on East Basin Drive. Unfortunately, it is not extremely close to the Jefferson Memorial. 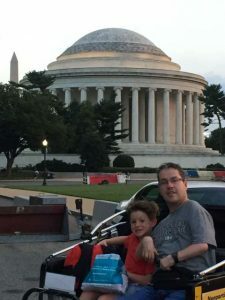 Here’s the info on handicap access to the Jefferson Memorial. There is handicap parking for the Lincoln Memorial right on Daniel French Drive. Inside the Memorial, you can access an elevator to take you up. 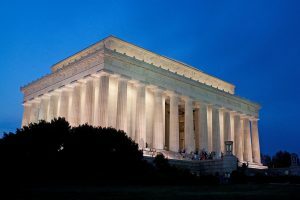 Information on handicap access to the Lincoln Memorial. 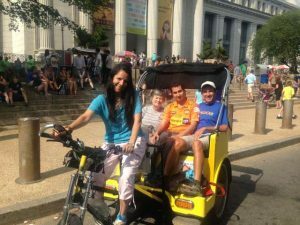 Nonpartisan Pedicab makes Washington DC Sightseeing easy. 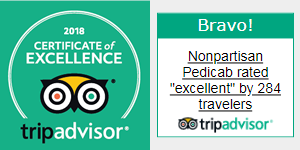 Just sit down in comfort, and let us take you to all the monuments in 2-3 hours. Easy and Fun! Smithsonian hours of operation vary by museum and by the time of the year. Many Smithsonian museums open from 10:00 to 5:30 PM. Some have later summer hours.